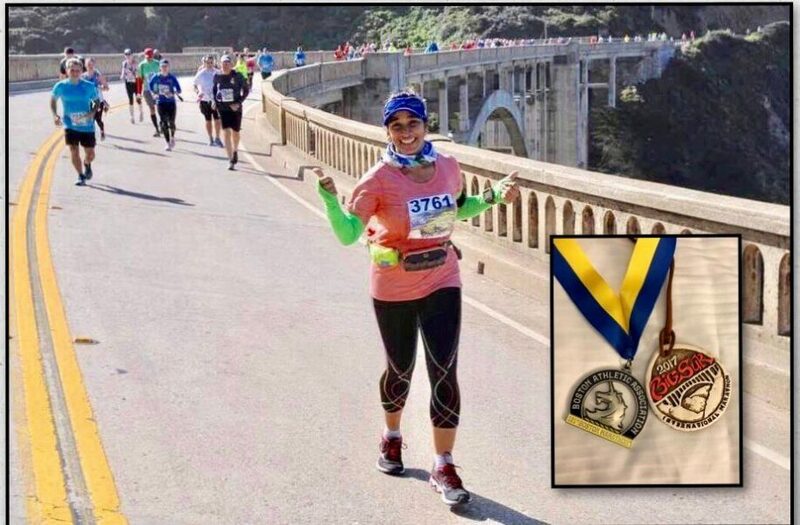 A homemaker, Mother of three kids – 23, 21 and 13, Sunita Tummalapalli is life’s example of boundless enthusiasm to mothers, non-mothers, runners and non-runners! In the last 7 years – she’s run 43 marathons including 6 Ultras and 2 multi-day races (Her half-marathons are not added to this number) – starting at the age of 40 – A Reebok Fitness Instructor, Yoga Instructor and has run all 7 continents! She definitely takes running everywhere! With 3 majors under my belt and a dream to run all the majors of the world, I really wanted to run the Boston Marathon as well to in my pursuit to earn that medal. And Boston Marathon is the one where you run next to the best runners in the world, it has history! But, I always knew about their qualifying times and that was disheartening. Fortunately, I was introduced to someone who works with few charitable organizations and she gave me few options. I applied with and was selected by 261 Fearless, a global supportive community which empowers women through running. It was started by legendary Kathrine Switzer and has a mission that is very close to my heart. In 1967, Kathrine became the first woman to run the Boston Marathon with an official race bib and number. Though she was nearly forced off the course by the organizers as women were not expected to run a marathon, her perseverance in finishing the 26.2-mile race made history and inspired generations of female athletes. This year, Kathrine, at age 70, was back running the Boston marathon. As a celebration of this 50th Anniversary of Kathrine’s historic run, Boston Athletic Association has granted 261 Fearless a limited number of invitational bibs for Boston Marathon 2017 to be used exclusively for fundraising purposes. Being part of Kathrine’s historic run made BM unforgettable for me. Running with Kathrine and being part of her team was an experience that I am going to cherish as long as I live. I feel very fortunate to be part of the 261 Fearless team to raise money for the cause, which was only possible because of support from my family and friends. We as a team raised over $800,000. I am always told by my friends and family that I inspired them to choose a healthy living and stay fit. I honestly feel that I made even a bigger contribution now by raising funds for this wonderful cause. I came to know about the Big Sur marathon 4-5 years ago. Looking at the pictures of the route, it was easy to fall in love with it. I don’t enjoy running on city roads overlooking buildings and houses. I prefer to run on scenic and hilly terrains. Big Sur Marathon is the largest rural marathon in the world. The race starts at redwoods and winds alongside ranches offering stunning views of Pacific Ocean. At exactly 21 km into the race we cross the Bixby bridge where the views are breathtaking. Both Boston and Big Sur Marathons are very similar in many ways yet offer very different experiences. They both are very hilly and tough. Boston marathon is known for ‘Heartbreaker hill’ while the Big Sur has a ‘Hurricane point’. Big Sur marathon offers breathtaking views that you don’t need/want too many spectators. It is point to point course and the route is closed during the race. The route signs are amazing and hilarious too! There are few aid stations on the route and we don’t see cheering crowd between aid stations as the road was not accessible to the public. There were hardly any cheering crowd to distract you from the views. There are bands playing music at various points. It was an amazing experience to listen to the waves crashing against rocks and musicians playing instruments. I saw few seals lying on rocks It has been 10 days since I ran Big Sur and I am still not able to forget the views offered there. I would like to go again and run this race. I love how Sunita constantly says that nothing is possible without family support. While she is still in the US with her friends and family -we did this blog over FB messenger and I really thought about how every woman can thrive so wonderfully if her family loved her, accepted her and supported her to turn her dreams into reality! No quotes here! Just life and its big and small beautiful experiences!